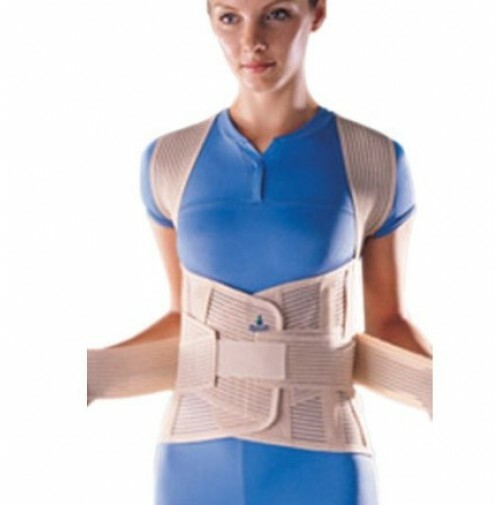 Oppo 2166 Elastic Spinal Brace two metal stays in back provide extra support to the spine. The four pliable stays provide extra support and stability to the lumbar area. The padded shoulder straps adjust and secure in front for easy application. The crisscrossing abdominal straps require minimal strength to fasten and provide exceptional support. It supports the lumbar and thoracic spine. Apply brace to the back and place the shoulder straps over the shoulder. Be sure the two longer stays are positioned on each side of spine and secure the waist straps comfortably around the waist. Pull the two side straps to adjust tightness then fasten. Pull the two shoulder straps under armpits to the back and cross each other. Then bring to the front and fasten securely.